Jeppesen Private Pilot Training Syllabus for Part 141. Provides an effective way to record all ground lessons, written exams, flight maneuvers, and flight checks. Full function, full size, composite construction. Perfect for the budget-conscious student. PTS contains the standards for adding an instrument rating to an airplane, helicopter, or powered lift certificate. Human Factors for General Aviation helps pilots analyze why accidents happen. Review the standard requirements for obtaining a commercial pilot certificate with an airplane single-engine land or airplane single-engine sea rating. This reprint of the FAA Commercial Pilot Airplane Multi-Engine Land PTS contains the standards for initial certification as a commercial pilot in a multi-engine airplane and for adding a multi-engine rating to an existing commercial certificate. Contains the FAA Question Bank for the private pilot knowledge test. 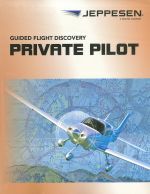 This reprint of the FAA Private Pilot Airplane Single-Engine Land and Sea PTS contains the standards for initial certification as a private pilot in a single-engine airplane or seaplane. Expect the 2016 edition, released in 2015. The most comprehensive book available on aircraft systems as they relate to pilots and pilot training. Shows you how to get the most from your circular computer. The Private Pilot Manual is your primary source for initial study and review on your journey to becoming a private pilot. Each maneuver is presented using colorful graphics, step-by-step procedure descriptions, helpful hints, PTS references and study exercises to help you visualize and understand each maneuver you will perform in the airplane. Practical Test Standards (PTS) for Flight Instructor Single and Multi-Engine Land and Sea, Instrument Airplane and Helicopter. With Best of AMJ Maintenance Tips, you cab do it better, faster, and easier with tips from the pros. A system-by-system approach to understanding jet transports.